Lectin-Based Glycomics: How and When Was the Technology Born? Lectin-based glycomics is an emerging, comprehensive technology in the post-genome sciences. The technique utilizes a panel of lectins, which is a group of biomolecules capable of deciphering “glycocodes,” with a novel platform represented by a lectin microarray. The method enables multiple glycan–lectin interaction analyses to be made so that differential glycan profiling can be performed in a rapid and sensitive manner. This approach is in clear contrast to another advanced technology, mass spectrometry, which requires prior glycan liberation. Although the lectin microarray cannot provide definitive structures of carbohydrates and their attachment sites, it gives useful clues concerning the characteristic features of glycoconjugates. These include differences not only in terminal modifications (e.g., sialic acid (Sia) linkage, types of fucosylation) but also in higher ordered structures in terms of glycan density, depth, and direction composed for both N- and O-glycans. However, before this technique began to be implemented in earnest, many other low-throughput methods were utilized in the late twentieth century. 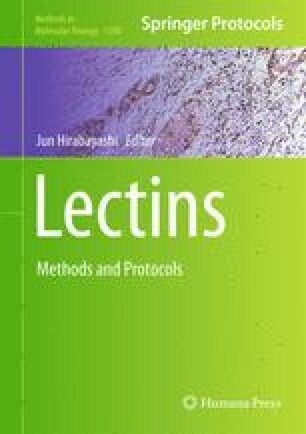 In this chapter, the author describes how the current lectin microarray technique has developed based on his personal experience.